On May 5th, 1938 the Regia Marina, the Royal Italian Navy, was paraded in the Gulf of Naples for the benefit of the visiting German chancellor Adolf Hitler. Although the German military staff had advised the German Chancellor on the inadequacy of the Italian Navy and the general lack of readiness of the whole Italian defense force, the fuehrer was impressed by the great spectacle. The high marksmanship demonstrated by the Italian gunnery and the impressive coordination of dozens of Italian submarines diving and reemerging in perfect synchrony was the disguising prelude to the fierce naval battles, which ultimately, in less than three years, would almost obliterate the 5th naval power in the world. 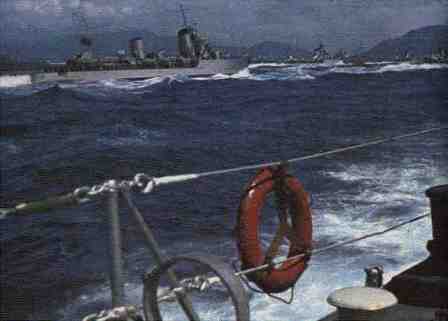 Italian destroyers in the Gulf of Naples. After the naval agreements signed in Washington, also known as the "Naval Holiday", Italy rebuilt several battleships and constructed new, powerful, heavy cruisers and many lesser ships. What the Italian Navy did not have, and would gravely pay for during the conflict, were aircraft carriers, enough supplies of oil, spare parts and, most of all, trained officers and crew. The performance of the Italian Navy between June 10th, 1940 and September 8th 1943 can be summarized by its tremendous losses: 28,937 casualties, 13 cruisers, 42 destroyers, 41 minelayers, 3 corvettes, 84 submarines and many more lesser ships. To increase these losses, after the Italian capitulation, the Regia Marina lost 2 battleships, 4 cruisers, 11 destroyers, 30 submarines and many more lesser ships. At the same time, despite the high losses, Italian officers and crew belonging to the 10th Light Flotilla wrote the most heroic pages of sea warfare in World War II. The 10th Light Flotilla alone sank 28 ships, including the battleships Queen Elisabeth and Valiant and the cruiser York. Ultimately, by keeping the flow of supplies between the mainland and North Africa, the Regia Marina accomplished its mission. These Web pages are dedicated to the memory of those who fought, in both camps, during this tragic period of modern history. Their unmarked graves are a solemn monument to their valor.